Some of the first people to adopt Medium have been great writers, which has made the user experience on the platform wonderful! Medium also does a really good job of recommending quality content that fits well with your interests. Like with other platforms, the more you use Medium, the more it understands what you like to read. 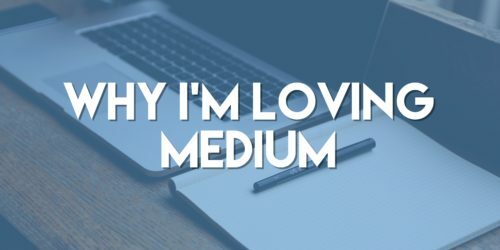 I have started following quite a few new people that I had never heard of before using Medium, & I love what they write! People like Jon Westenberg have done very well on Medium since he always manages to deliver valuable content to his audience. When you write a comment on an article, it doesn’t just live in the comments section of that article. It shows up as a mini story on your own profile feed. This encourages commenters to add something to the article & conversation & encourages people to be supportive rather than hyper critical. It is a unique feature to be able to be discovered just because you had a great response to someone else’s piece. It fosters healthy discussions, which is something that has been missing from other platforms. Medium offers an easy way to get more eyes on your content. They make it very simple to import your blog posts by simply copying & pasting the url so that you can cross-post to Medium & your own blog efficiently & effectively. Medium also has publications that accept guest writers, which opens up great opportunities for exposure. You can use SuperMeditor.com to easily apply to publications that are looking for writers. As with most things, it is best just to sign up & try it out for yourself. You can follow me on Medium here, & feel free to reach out with any questions!